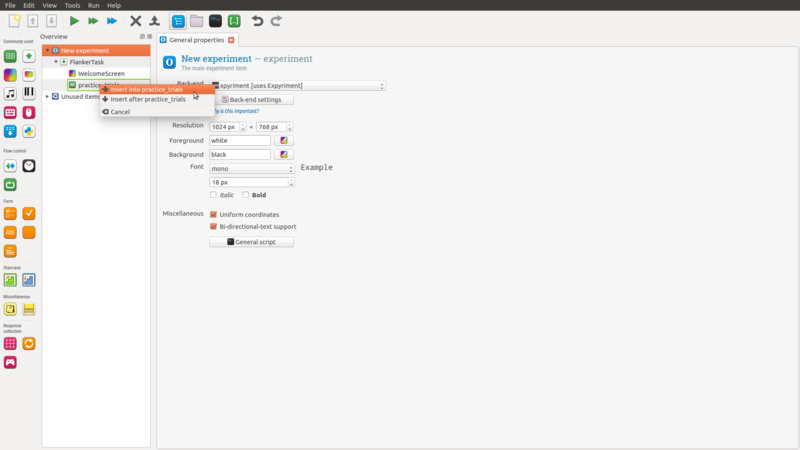 In this post you are going to learn how to create a simple experiment using the free experiment building software OpenSesame. As I have previously written about, OpenSesame, is an application, based on Python, for creating Psychology, Neuroscience, and Economics experiments. 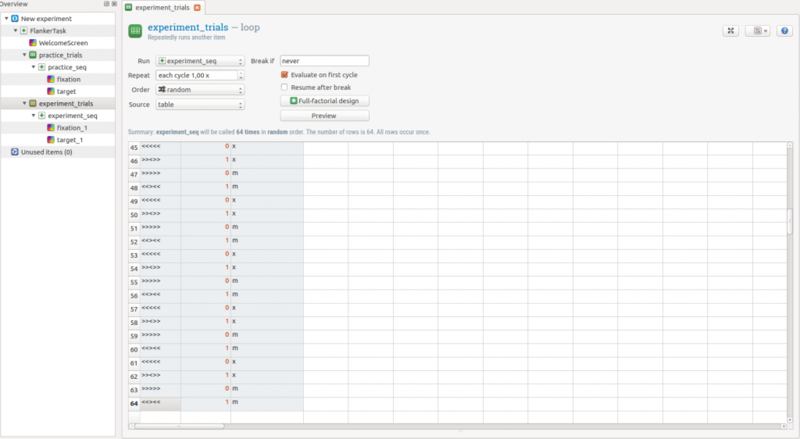 It offers a nice and easy to use interface. 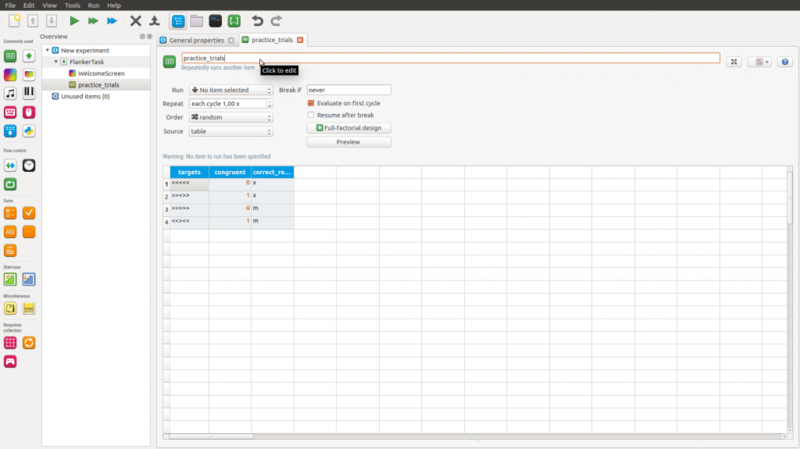 In this interface you can drag-and-drop different objects. This means that you don’t have to know any Python programming at all to create an experiment. 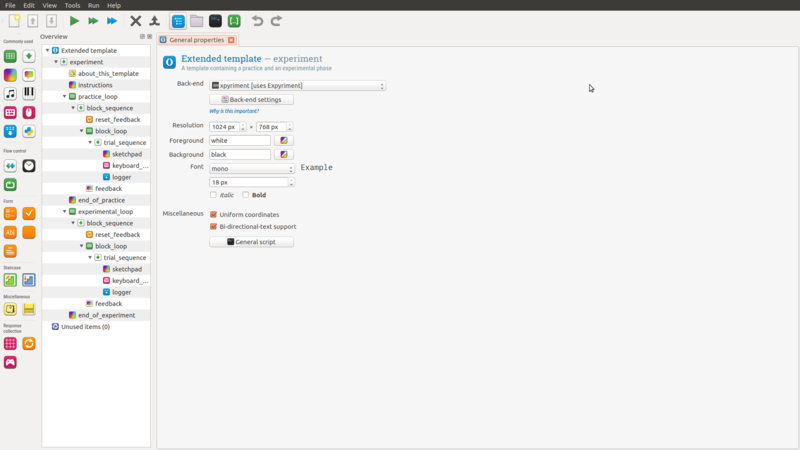 If you need to know how to use images as stimuli you can see this OpenSesame Tutorial. The task we are going to use in this OpenSesame tutorial is a version of the Flanker Task. In the version we are going to use here the task is to respond, as quickly and accurate as possible, to the direction of an arrow. The arrow will be surrounded by either arrows pointing in the same direction (congruent; e.g., “<<<<<“) or in the other direction (incongruent: “>><>>”). 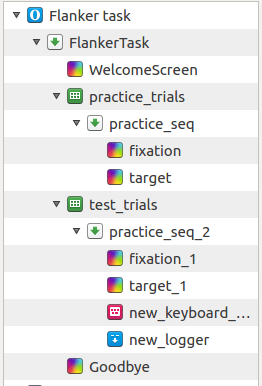 In the example, there will be four practice trials and 128 test trials. Each trial, whether practice or test, will start with the presentation of a fixation cross for 2000ms. Following the fixation cross, the target and flankers will be presented (also for 2000ms). The general layout can be seen in the figure below. Generally, this is how OpenSesame looks like when we start it. Now we go ahead and delete the getting_started by right-clicking on it and select “Permanently delete all linked copies”. The next step is to create a loop for our practice trials by dragging and dropping the loop object under our welcome screen. 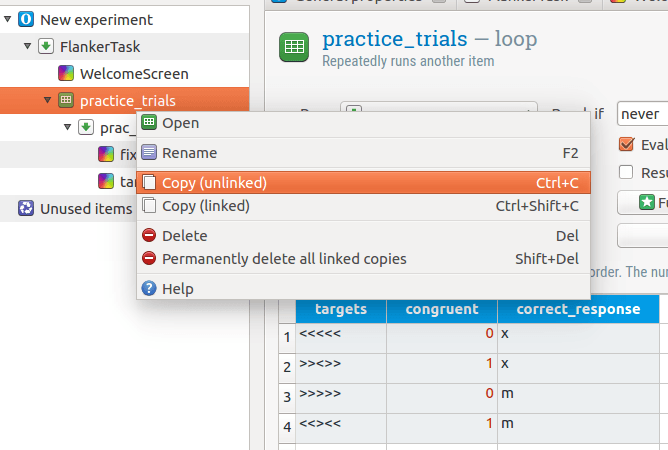 We put it under our welcome screen and give it the name “practice_trials” by clicking on the new_loop (blue text). In our case, we add 4 trials. First, we name 4 columns, targets, congruent, and correct_response. In the column targets, we put the four different types of stimuli we are going to use in our example (e.g., “<<<<<“, “>><>>”, “>>>>>”, and “<<><<“) and in the column congruent we put 0 and 1 for congruent and incongruent trials, respectively. Finally, we add the correct response in the last column (“x” for pointing left and “m” for pointing right). 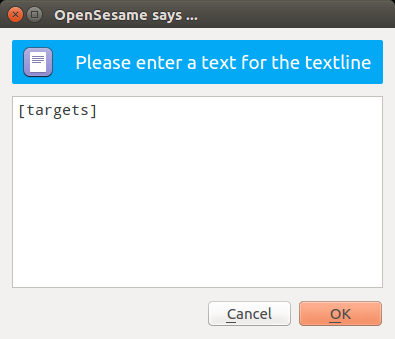 It is important, that we write “targets” within the brackets because this is what tells OpenSesame to get the text we wrote in the column earlier (the practice loop). As you may notice in the image below, we also set the duration to 2000ms and increased the font size (36 px). What seems to be important here is to untick HTML. Using the HTML setting it seems like the arrows (“<“) looks a bit weird, namely. 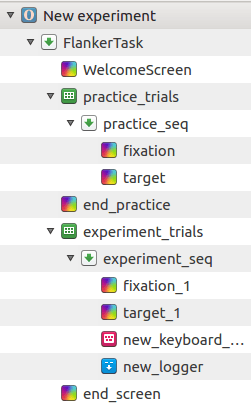 Since we don’t typically use the data from practice trials we skip, in this OpenSesame tutorial, how to collect responses. We will look at this when we create our test trials, however. Because we want to have some data recorded (i.e., correct responses and response time) the last thing we will add to the experiment is a logger. In this object we just leave it so that it logs everything but we could, if we would like, just tell OpenSesame which different items we want to record. 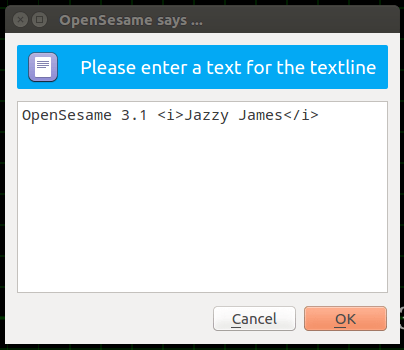 That was the OpenSesame tutorial. 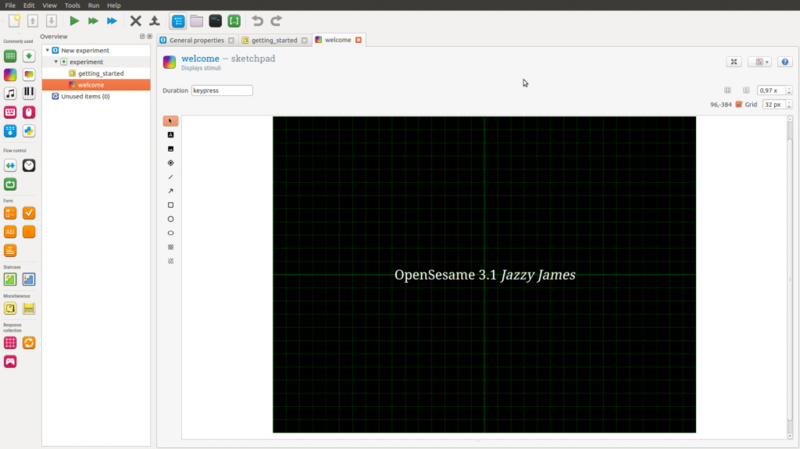 Now we know how to create a Psychology experiment using the free tool OpenSesame! I compiled the how-to as a PDF: OpenSesame Tutorial- How-To Create A Psychology Experiment.pdf.